10Sep2012 posted by: liltiger | share this: category: Events: Past, Houston, Lil Tiger, Music, Updates no comments yet. 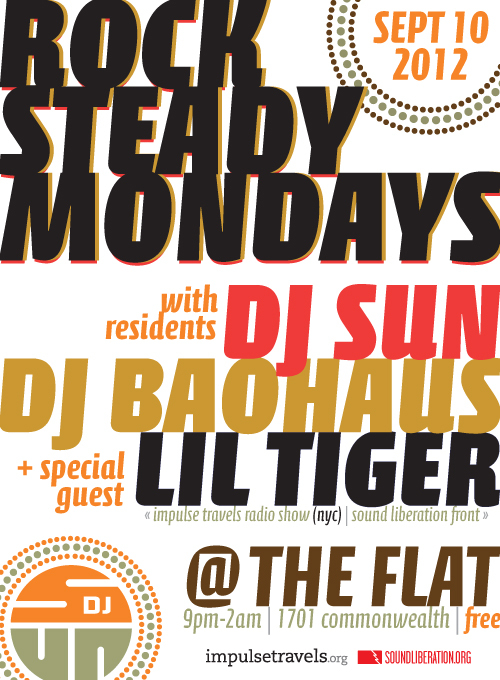 I’m in Houston this week, and TONIGHT, I’ll be reuniting with my Soular Grooves family as I team up with DJ Sun as the special guest at his ROCK STEADY MONDAYS party at The Flat. Come through and give me a shout/dap/hug/ginger beer.